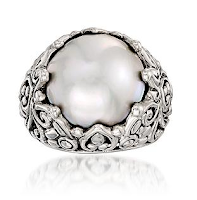 June is pearl month on the birthstone calendar, and also time for special-occasion gifts such as graduations and weddings, so I'm back with a bonus pearl post about a specific variety, the mabé pearl. Mabés make a good gem buy for the price, given some discernment. How much of a buy? 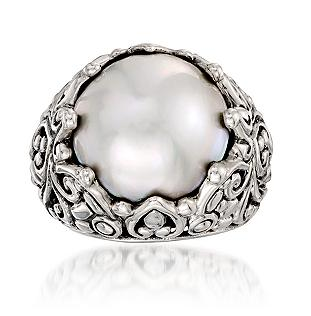 The ring shown, from Ross-Simon, features a 15mm mabé set in silver, on sale for $75. Mabés are made, like all cultured pearls, by introducing at least one nucleus (shell, plastic or other material) into the oyster, in this case, between the shell and the mantle, the part of the oyster that produces nacre. 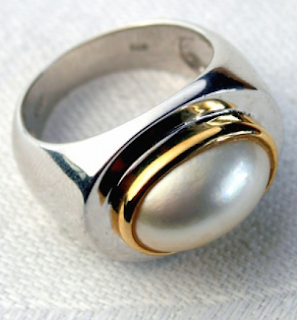 The term blister or half pearl is also used for mabés. The photo above shows that one shell can yield several mabés. 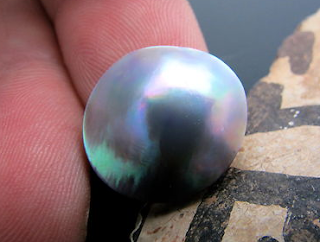 The nacre of that oyster variety creates intense rainbow overtones and wild iridescence in the best examples. I've seen mabés that look almost back-lit with swirling greens and blues, or intense rose overtones shimmering with green-gold flashes. Some producers dye mabés (usually blue) or enhance colour by placing a deeply-coloured material under the blister; such treatment should be disclosed. They will be set to cover the back, in a bezel or recessed setting. Mabés are popular for pendants, where a flat back is often preferred. 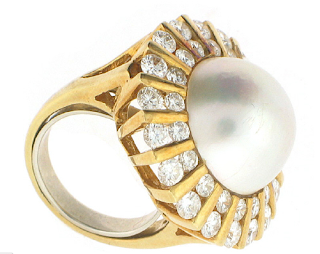 The gold and silver mabé ring above, designed by Steve Crawford, is offered by Australian jeweler Panda Pearls; price, $245 (AUS). 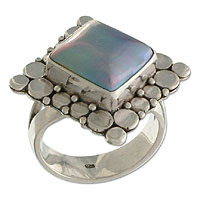 A Balinese silver cocktail ring with a blue square mabé, a big splash of cocktail in your glass for $99.99 from Novica artist Diah Ayu. If you have your own design ideas, one of the reputable dealers who sell loose mabés is Carolyn Ehret, who maintains an eBay store, Ehret Design Gallery. Here's an example, wildly glowing Sea of Cortez mabé, 15 x 17mm, BIN price $89. Keep a lookout for richly-hued mabés. Dull or cheaply-made pieces have, in the past, tarred then with a head-shop rep, but in good hands, a mabé delivers pearly pleasure for far less than other varieties. Mabé's affordability is a secret among fine jewelers. I had no idea that mabes were filled! Thank you for the information. I have a pair of earrings, they are so Joan Collins Dynasty that they are almost back in fashion:). LPC: Yes, that's hardly ever mentioned as it scares women. We know exactly the kind of earring you mean! 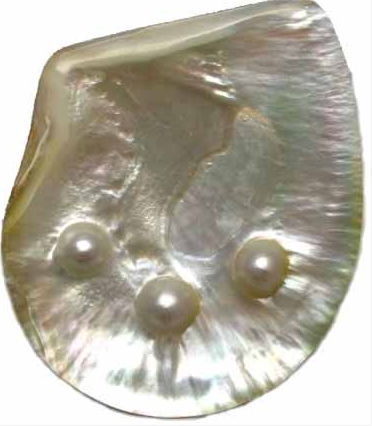 I have a pair of big (quarter-sized) blister pearl earrings that have no setting at all -- just a hole drilled through and a simple ear-wire. Because they're modern, dramatic and lightweight, I wear them a lot, with everything from jeans and tees to cashmere and silk scarves. MamaRubi gifted them to me, and I think of her every time I wear them.